When I got out of my car, ditched on the side of Old Alabama Road in the Atlanta suburb of Roswell, I had been in the car for nearly four hours. I was about to start a 2 mile walk. As I walked home, I started thinking up one of those funny, bad luck/tough luck type blog posts to chronicle my journey. For a moment, I jokingly fancied myself just shy of those heroic individuals, both real and fictional, whose journeys home are the stuff of legend (I actually thought of Laura Hillenbrand’s book Unbroken, the harrowing story of World War II hero Louie Zamperini–I realized that this little situation was about to break me and it was nothing compared to what he went through). 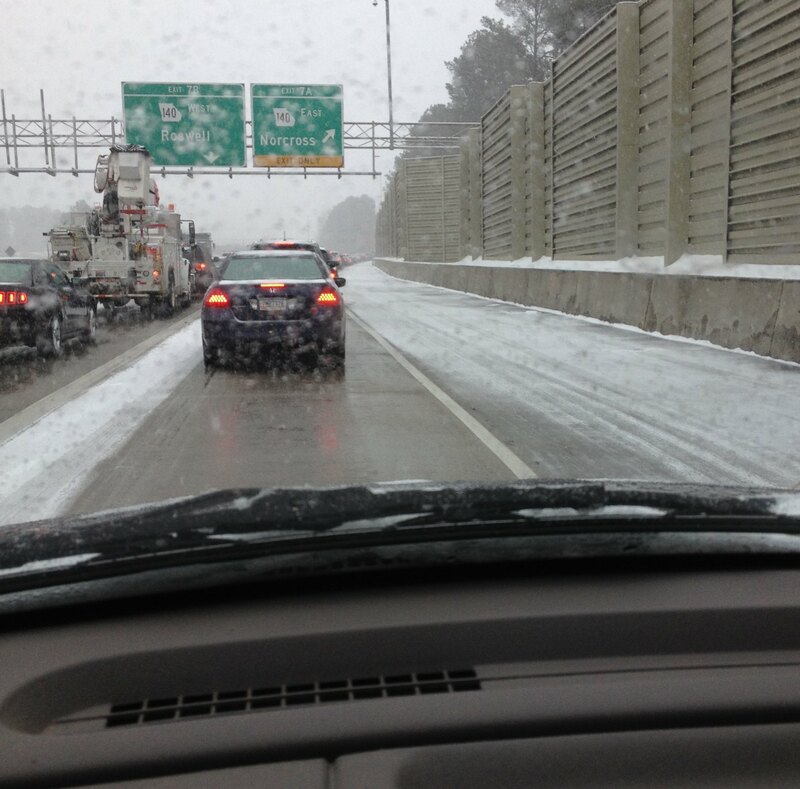 But alas, the worst part of my situation was a full hour stuck on an exit ramp from GA-400 to Holcomb Bridge Rd, spinning ever so slightly every time I inched forward. I kept reminding myself: the worst that could go wrong is a fender bender or a misfired attempt at relieving myself into a water bottle. I was wrong, though. That’s not the worst that could have happened. I was actually extremely blessed and fortunate. My 4 1/2 hour trip home was nothing. Absolutely nothing compared to the fact that now, nearly 21 hours later (at the time of this writing), people are still gridlocked at various locations on interstates, side streets, taking shelter in random churches, community centers, and schools. Kids were (and are) still at schools and on school buses. Moms and dads are still trying to leave work or get to their children at their schools. On social media, I followed a friend’s 11.5 hour ride home with her 5 year old in the car. 11.5 hours. 8 miles. Luckily she made it home. Another friend, with a one year old baby, got stuck. Her husband walked three miles to get her and trekked them back home. 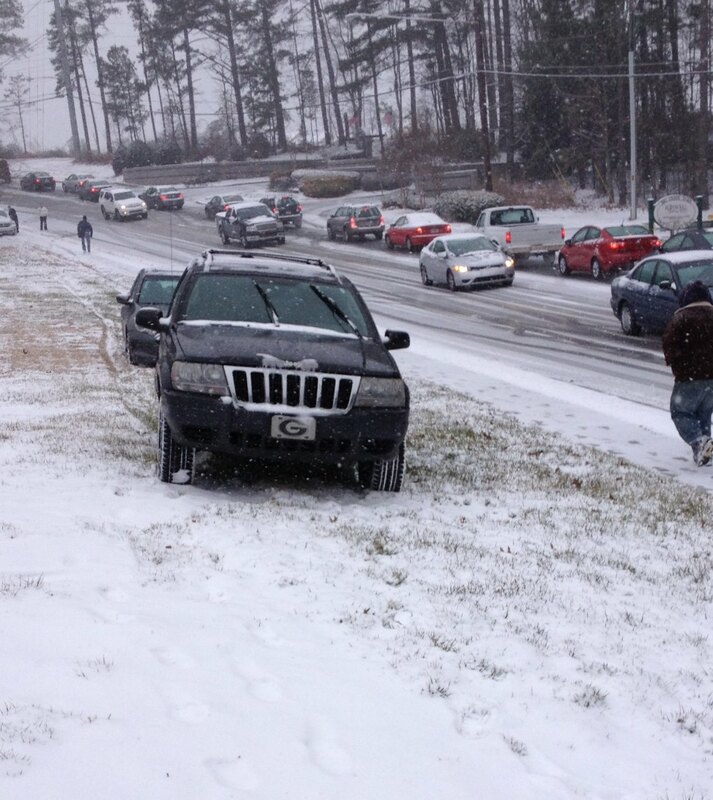 Yet another’s husband was stuck somewhere in Dunwoody. Through the magic of Facebook, connections were made, and he was able to find a warm home, bathroom, and some food and drink. And those were the lucky ones. Crazy to imagine that those were the lucky ones. I’m sure Facebook will feature plenty of memes out there ragging on southerners and our lack of winter driving skill. They will show pictures of the roads, I predict, at least 24 hours into this mess, still at a stand still. And I’m honestly scared to know of other stories. Insulin missing. Panic attacks. Or even worse. A baby was born on 285 – only one as far as I know, but who knows how many others. One of my other serious concerns is that mayors, governors, heads of departments and school systems will hedge and make excuses all because they’ll be scared to admit fault, poor planning, or lack of wise decision-making. We all make excuses, but hopefully those who need to lead our communities will take this situation and learn and learn and learn. On the other hand, I was supremely encouraged by the generosity I’ve read about and the dedication of parents, neighbors, and teachers and random people willing to put themselves at risk to help others. Fathers and husbands walked miles to either spend the night with their children or walk their wives home. A man in our community routinely drove out in his 4X4 truck to rescue stranded drivers. On the morning after the main ordeal, random folks were showing up with sandwiches, hot chocolate, and other necessities. The best in us tends to make its way out when these types of events happen. There are lessons to learn, but y’all don’t need me to lay those out for you. What we do need is greater wisdom and preparation. And we also need to pray for anybody who might have endured more than just stress and a sleepless night. What’s your story? Were you out there in the mess? I’d love to hear your experience in the comments below. So glad you made it home safely! You’re right you were very blessed. I agree. I was. I didn’t realize it at the time, but wow.